We are happy to share with you that our team has found a way which will bring you even closer to your loved one. In this way you can share your memories and relive those irreplaceable moments anytime, anywhere. From now on you will have access to the tribute of your loved one, for instance your dad, within 1 click. By placing your tribute on the home screen of your phone. Below you can find a very simple step-by-step guide to have your loved one always with you. You can also click here for an instruction video. We are here to help you and make it as easy as possible to remember your loved ones. Keep them in your heart 1 beat away. Keep them in your phone 1 click away. As ever, we really welcome your suggestions, remarks and questions. You can always reach us via social media or via mail. Brenda Schmitz, a real guardian Angel. These are the words Brenda started her letter to her husband, 4 children and her husband’s new wife with. Brenda’s final wish before she died was to mail a very special letter to a local radio station the moment her husband David had moved on in his life. Brenda really wanted her husband to find a new lovely wife to share his life with. Brenda asked for three special gifts in the local radio station’s Christmas wish program. First was a day or weekend full of pampering for the new woman in David’s life, because she deserves it. For the family- a magical trip somewhere where they all can enjoy their company and companionship as a family and create those memories that will be with them forever. And finally for the cancer doctors at Mercy Hospital and nurses of 8 south. A night out full of drinks, food and fun for all they do everyday for cancer patients they encounter. This must have been a very special Christmas gift. First subject on the infographic is the overall death facts of 2013. For example, did you know that last year 56.608.240 people have died, including 5.003.573 because of smoking? Some very shocking facts you’ll never think about until you’re confronted. Besides that, there’s a list of the most discussed deaths in 2013. Unfortunately, this list contains some actors and actresses who died way too young, But also inspirational leader Nelson Mandela who is featured on this. People sent out lots of tweets the moment they heard Nelson Mandela died, but did you they sent out a total of 7.4 million tweets? 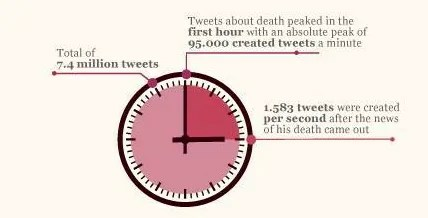 With a peak of 95.000 created tweets per minute? This means Twitter published 1.583 tweets about Mandela per second in the first hour after he died. Even dead people earn money; you can see this in the best earning dead celebs section. Elvis Presley’srelatives still earn about 55 million dollars a year. Michael Jackson’s relatives earn even more; about 160 million dollars a year.